Bosco unlocked the small but thick wooden side door that granted access through the outer wall into the mansion grounds. He passed a pair of guards, paying them each a coin as he made his way to a building assigned to the janitors and groundskeepers. As he pushed open the old, wooden door, he could feel the cold of the stone walls and rubbed his hands together briskly. Bosco was short, thin-lipped, with black hair that seemed even darker against his pale skin. He was in his early twenties and had already worked for the Orzhov for years scrubbing steps, polishing brass, mopping floors. But Bosco had plans. He wouldn't be a mopper for long. He was making connections and would soon make his mark. He began to collect his mop and bucket when Jozica's thrull shuffled in. 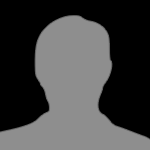 Jozica was the enforcer employed by the owner of the estate. Bosco feared her. The thrull, he hated. "Three coins." The thrull sneered behind its golden faceplate. "Mopper tax," it said, with as much high-pitched, slobbering relish as it had done on Bosco's first day. Its little grin of satisfaction and demanding whine had, over time, turned the thrull into a mortal enemy. For a split-second, Bosco imagined kicking the thrull across the room and driving his mop handle through its gilded faceplate, but he quickly thought the better of it. It was Jozica's personal thrull and Bosco knew she was quite fond of it. One lapse in reason and he'd be indebted to her for a long time—or worse. The thrull flinched and hissed at Bosco as he dropped the three coins into the locked moneybox, as if its primal senses somehow knew of Bosco's inner desire to crush its bones into paste. As soon as the coins clinked the thrull clutched the box tightly in its rubbery, gray arms and scurried off, snickering to itself as if it had pulled off a most ingenious heist. Bosco swallowed another urge to chase it down and feed it the moneybox. Instead, he grabbed his mop and bucket and proceeded to the large stone floor of the mansion's main hall. The slapping sound of the thrull's feet echoed in the distance. Bide your time, Bosco, he thought. Your time is coming. "Five centuries," Bosco said, over a mug of bumbat. "What?" Drovo almost spit his bumbat out his nose. "That's how much debt I owe to the guild. Five centuries all told." "That's insane. How did that happen?" "Well, I was new to the Orzhov—a joinant. For their protection, benefits, stability, and opportunities, I had to make a substantial buy-in. I wasn't born into the guild so I haven't had ancestors working off debt for me. So I incurred a few penalties." "Krokt. What made you finally do it?" "You know what it's like being unguilded: everyone kicks us around and nobody gives us any respect. 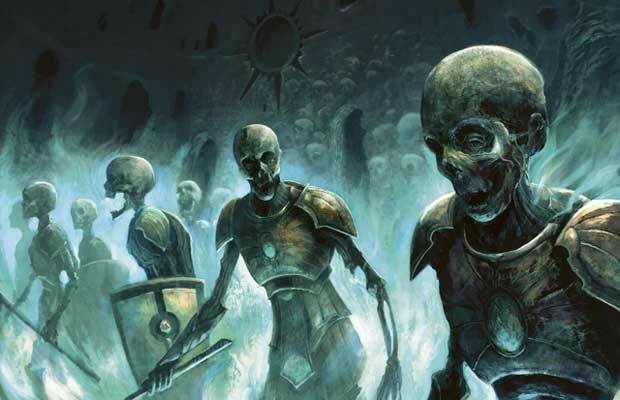 But the Orzhov, they walk the streets like kings. I mean, look!" 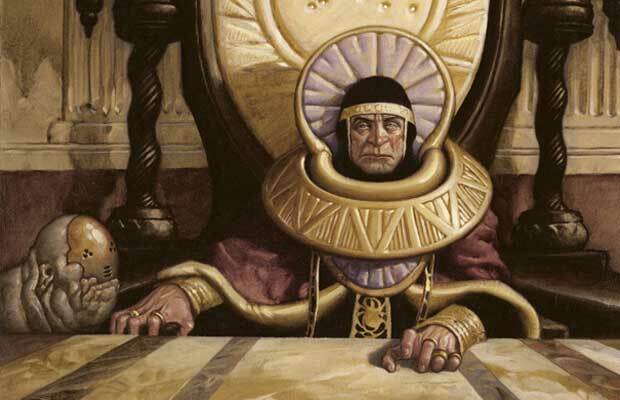 Bosco moved his chair back off of the table to allow his friend to admire his new black-and-white mopper attire with gold threading, silver buttons and cufflinks, all emblazoned with the Orzhov guild symbol. "I'm just a mopper and I get these clothes. People give me respect and I can always get an advance from an Orzhov coiner for another year of service." Bosco plopped a fat purse of coins on the table. 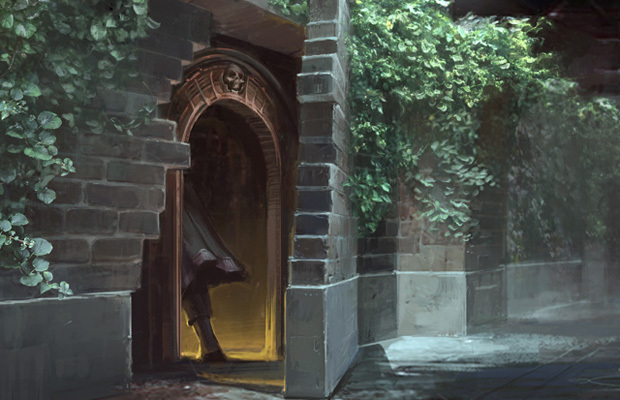 Bosco's impeccable Orzhov tailoring and sack of coins created a pang of envy in Drovo. "What happens when you... you know, die?" Drovo asked, a bit apprehensively. "I don't care about that," Bosco said, a little too abruptly. "It's about getting what's mine while I'm alive, Drovo. Who cares after I'm dead? 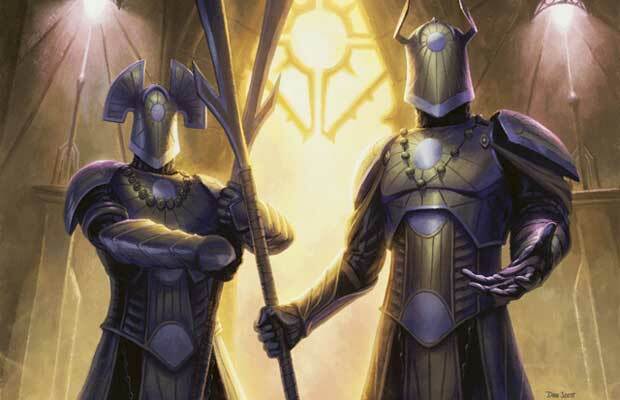 The Orzhov encourage ambition, someone willing to do what it takes to move up." Bosco balled up his hand into a fist for emphasis. "I'm going to take every opportunity I can get. I'll show them that they can't do without me. I may even be able to buy off some of my after-debt. I could even live an unlife of luxury if I play my cards right. " "Whoa. You've really become an Orzhov. I know the last time we met you were talking about it but I didn't think that you'd really do it. I thought you'd join the Gateless or something." "The Gateless. I want to be a part of something powerful. The Orzhov own Ravnica. 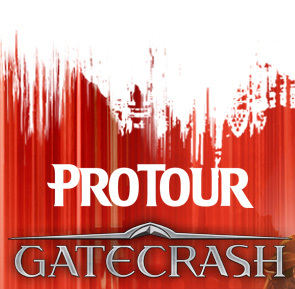 They don't get pushed around by the other guilds." Bosco leaned in. "I'm going to be promoted fast here Drovo. 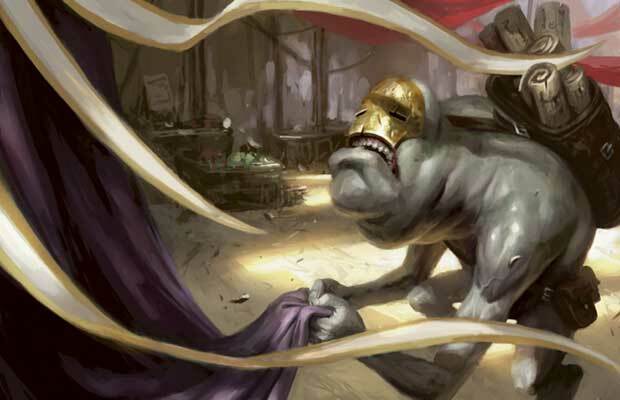 The Orzhov know how to reward ambition and I know someone who has the power to make things happen for me... and you can be a part of it too if you're up for it." "Sit down, Bosco," Jozica said. Bosco hated the fact that he still felt uncomfortable around the Orzhov enforcer. He could almost feel the amount of death she had handed out and how easily she had done it. He tried not to look at her. The high prelate sat behind a black slate desk on a golden chair etched with Orzhov symbols and covered with lavish, embroidered cushions. A thrull pushed a chair toward Bosco and quickly fled behind some thick velvet curtains before reappearing at the high prelate's elbow, purring as it offered a dish of grapes. Bosco sat down. The high prelate was a lifeless man. A lifetime of lies, swindles, and graft had pulled his features down into an impassive mélange, where apathy and disgust were permanently fixed. The high prelate seemed to stare off into space. Bosco was beginning to feel like the old man maybe wasn't all there. As soon as Bosco looked at Jozica, he saw the high prelate's eyes swivel and lock on to him in an unsettling, reptile-like manner. There was a sharp mind still lurking within the folds of flesh that hung on his face. A mind that evaluated Bosco like a butcher would evaluate a side of beef. Jozica produced a contract and slid it toward Bosco. Halfway across the table the high prelate interrupted its journey, placing a fat, ring-encrusted finger on it with a thud. "This will magically bind you to your word and deed." The high prelate's voice croaked out at him, his speech punctuated by strained wheezing. "You sign this, carry out your task, and your debt will be substantially reduced by the terms agreed to." The high prelate then pushed the document toward Bosco. It made a crispy, rasping sound. As Bosco reached for the contract, the high prelate looked at Bosco with his wet, coal-like eyes. "We may even have more work for you." Bosco hurriedly signed the contract and felt the tingle of Orzhov magic along with the thrill of opportunity. "Over there," Bosco whispered, pointing to a sconce on the wall. "Pull it." "Are you sure that it won't raise an alarm?" Drovo asked. "No. I told you, once we got past the guards everything would be easy pickings." "You better be sure." Drovo reached up and, with some effort, pulled the sconce. It made a grinding sound followed by a mechanical click, as a section of wainscoting popped out. "That's it," Bosco whispered excitedly. He took a glance down the candlelit hall, making sure no one had spotted them—especially Jozica's thrull. "Go through there." Drovo pulled open the oaken panel to reveal a small, stone staircase winding down into the darkness. "Quickly," Bosco hissed, looking both ways as he followed Drovo down the stairs, locking the panel behind them and then striking a small torch to light with a piece of flint and steel. "Keep moving," Bosco said, as the torch sputtered and popped. "It's at the bottom of the stairs." The two moved down the stairs, feeling the air grow colder as they neared the bottom. A long, narrow hallway only wide enough to pass single file stretched beyond the light of the torch. Drovo looked back nervously. "Keep going. It has to be down here." Bosco nudged his friend forward. They walked down the chill corridor. The air smelled of earth and must; the light of the torch animated their shadows into dancing specters. 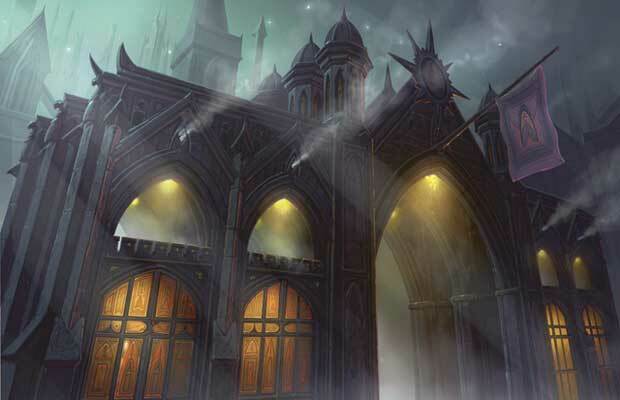 Ahead, they could see the hallway open out into a circular mausoleum, a massive Orzhov guild symbol emblazoned on the floor in onyx and ivory tile. The tip of each point of the guild symbol housed a heavy, iron-bound door. The two walked into the center of the mausoleum and looked at the doors. "Which one is it?" Drovo asked. Bosco pointed to the one diagonal from the entrance. "That one over there." They walked to the big door. "It's locked. Do you have the key?" Bosco smiled and held up a heavy, iron key. "I told you I was prepared." Drovo stood aside as Bosco handed him the torch and inserted the key in the lock. He gave it a turn, and the tumblers groaned a bit as the latch slide open. Bosco pulled the door open and pulled another torch from his rucksack. "Go check it out. I'm going to make sure we weren't followed." 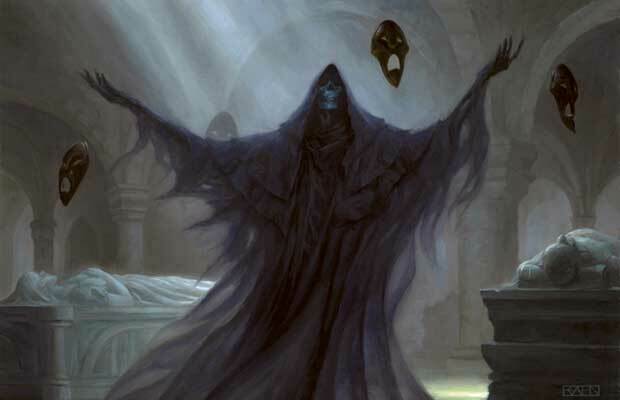 Drovo stepped into the interior of the tomb, a pair of stone sarcophaguses sat before him, their lids carved with what appeared to be Orzhov nobles. There would be plenty of treasure for both of them within these tombs. Getting past the lids without making too much noise would take some careful work but it could be done. Drovo unshouldered his pack. "We're going to have to find a way to slide these lids off carefully, Bosco. I brought a couple crowbars and some rope. We might be able to lash them to those rings in the ceiling. Hey are you...?" Drovo turned around to see the door close and the lock slide shut with an echoing clack. He ran to door. "Hey! Bosco, what in Krokt's name are you playing at?" On the other side, Drovo could hear the muffled sound of his friend's voice. "Sorry Drovo. You were right, five centuries is too long." A hissing noise came from behind Drovo. He wheeled around to see black smoke gushing from underneath the lid of a sarcophagus. The smoke looked like ink dropped into clear water, swirling and tumbling into the air of the room and filling it with an overpowering smell of the dank bogs in the overgrown areas of the Sixth District. It was as if the smoke was being pulled directly from the foul swamp. The black smoke had begun to form into large, hanging swaths of tattered cloth surrounded by a circle of masks that rotated around a skeletal figure. Drovo gagged on the stench as he rushed to his pack and clawed out one of his crowbars in a panic. As he wrenched it out, part of his pack ripped and sent tools scattering across the stone floor. The masks rotated around the cowled figure faster, creating a moaning sound as a grim skeletal face manifested. It dripped fetid water and focused its eyeless sockets on Drovo, who hacked at the door like a caged beast. "What's this?" The crypt ghast hissed amid the din of the moaning masks. Drovo's hands bled; the crowbar slipped from his fingers and clattered on the floor. "Blood." The apparition gasped with palpable pleasure as Drovo reached for the bar with his blood-soaked hands. "Blood." "As you instructed, High Prelate," Bosco replied. The high prelate slid a small, leather sack of coins across the slate desk at Bosco. "You've proven yourself quite useful. There will be more work for you in the future." "Thank you, High Prelate." Bosco took the sack of coins. The weight was more than he'd ever held. As he left, he ventured a look at Jozica, who stood impassively at the high prelate's side. Much to Bosco's surprise, he didn't feel afraid anymore. He turned and closed the large door behind him with a smirk on his face. "I didn't think he had it in him," Jozica said. "After enough time, I've come to know what lies within a person's soul. That boy has got ambition written all over him."